Work on Jersey's Millennium Town Park will start this year if proposals by the St Helier Constable are agreed. Constable Simon Crowcroft has lodged a proposition with the States calling for work on the site, encompassing the Gas Place car park, to begin. He suggested using the Ann Court site, rejected for a permanent multi-storey car park, for temporary parking to allow work to begin quickly. In September, politicians voted to set aside £10m to pay for the new park. Talks about developing a park on the site began in the 1990s. 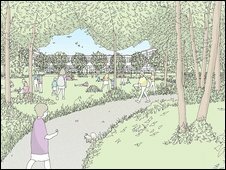 Plans were unveiled for the site last year, with the design including homes around a park which the site architects said was aimed at making the area more secure. More than 600 car parking spaces would be lost to make way for the park and politicians have been discussing how to replace those spaces without building a multi-storey car park at Ann Court. In addition to suggesting the Ann Court site for a temporary car park, Constable Crowcroft has said he thinks the amount of green space available should be maximised with no houses or other buildings developed. In his proposition, he said this was in part as the "densely populated part of St Helier lacks sufficient green space". The States Assembly is due to debate the proposals on 20 April.